For as long as I can remember I've been coveting M.A.C's Saint Germain lippie. It's one of those cult classics and one of their best sellers that everyone seems to have in their stash. I realised just recently that I had quite a few M.A.C empties and as I'm sure most bloggers are aware, M.A.C do a recycling programme. Take back 6 empty products and you get a free lipstick. Some exclusions apply such as you cannot return secondary packaging, no samples (includes holiday kits), no accesories and no tools. 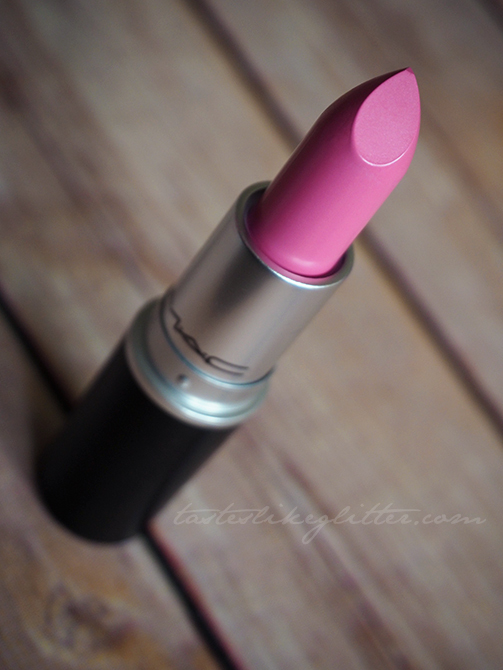 M.A.C describe Saint Germain as a clean pastel pink. I would agree, though on my fairer skin tone it looks a little less pastel. I've seen it on those with deeper skin tones and it tends to look a little paler. It's definitely got an edge to it and it reminds me of a pink you'd see Barbie wearing. Saint Germain is an amplified finish meaning it's super creamy, pigmented and it gives a glossy finish on the lips. You get full coverage and really good colour payoff with barely any effort. Because it's an amplified it does tend to err on the more slippy side when first applied. It does mean that it's not at all drying on the lips though. Since the formula is a little more creamy, wear time lasts between 4-6 hours depending on whether you're eating or drinking. But a quick re application and you're good to go. If you've been looking for that perfect blue based, Barbie pink lipstick this is the one for you. It goes perfectly with a winged liner look or smokey, neutral metallics.